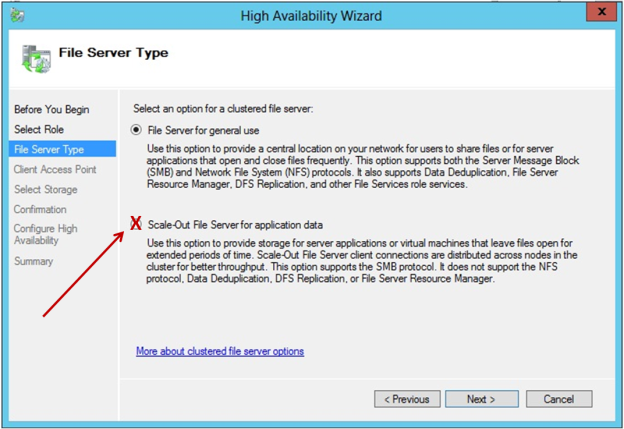 The new option, “Scale-Out File Server for Application Data”, is not currently supported. When selecting a File Server Type, the first option, “File Server for General Use”, must be selected. This File Server type existed in failover clusters prior to Windows Server 2012. It can be used to increase the availability of files that are shared for use by users or by applications that open and close files frequently. Note: Windows Server 2012 ReFS (Resilient File System) is also not currently supported.